Veggie-loaded for a fresh, crisp crunch, these guys will become an addiction. For a healthy twist, use oven “fries” instead of actual fries. All the flavor; none of the guilt. I’ve lost the ability to creatively introduce potatoes. I promise I won’t post any more potato recipes until I’ve come up with some clever ways to entice you into reading more. I’ll tell you instead about the inspiration for these fries. My Greek friend ordered Greek fries from a restaurant. 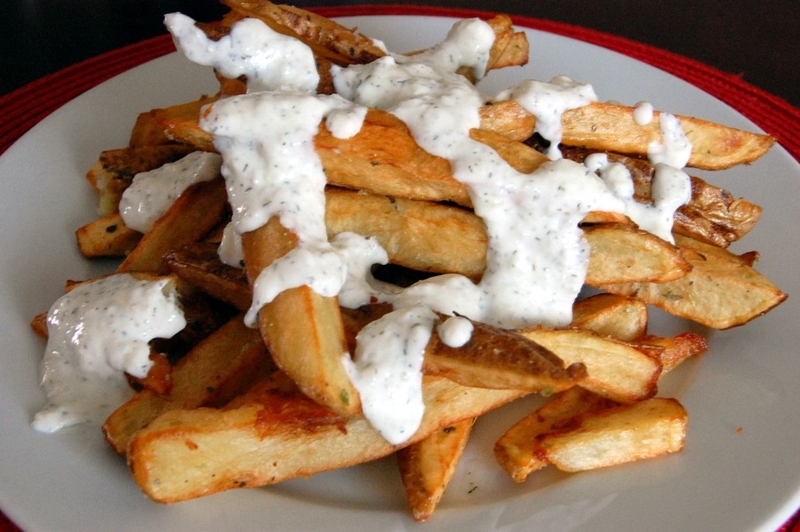 What arrived at her table was a plate of fries tossed in olive oil with oregano, garlic and feta. She instantly sent me a text about creating a version to blog about and we agreed that adding a simple Greek salad on top of the potatoes was the way to go. While your spuds are cooking up (whether you’re frying or baking), you have plenty of time to get the rest of your ingredients ready. 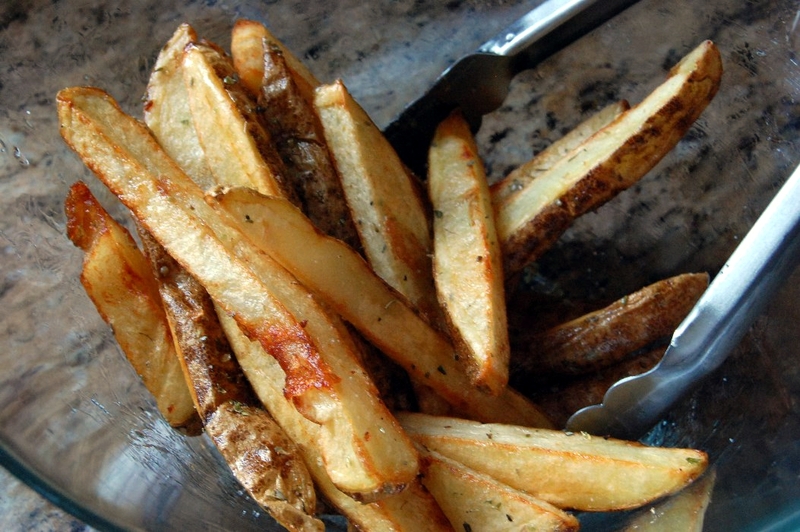 For the record, you can toss the three ingredients above with olive oil, oregano, salt and pepper for a salad as addicting as these fries. That would be the salad I was referring to above. The key to seasoning fries is to do it while they are still piping hot. The seasoning (in this case salt and dried oregano) will adhere to the potatoes while they’re hot. Think about it; what happens when you’re at a restaurant and your sever puts flavorless fries in front of you? You sprinkle the salt over them and it bounces off the fries and scatters across the table. If you would have hit them while they were still hot, you wouldn’t have that problem. There was a reason I taught you a thinned out tzatziki a few weeks back. There are a million ways to use this low calorie, high flavor sauce. 2. Prepare toppings while fries cook. 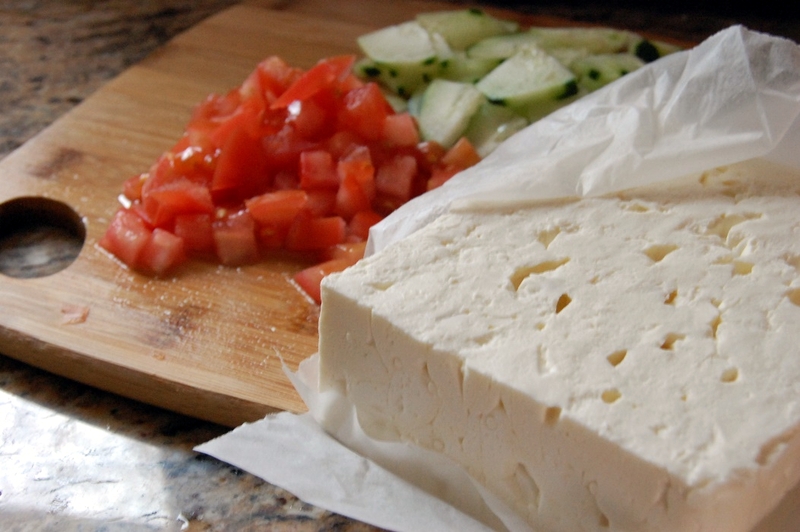 To prepare tzatziki, add Greek yogurt, cucumber (seeds removed), and dill to food processor and process until smooth. 3. 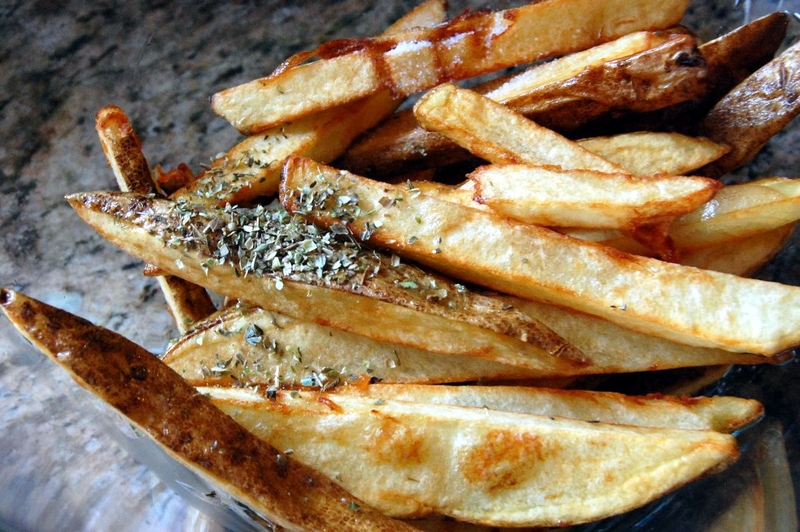 Remove fries from oil and immediately toss in large bowl with oregano and salt. 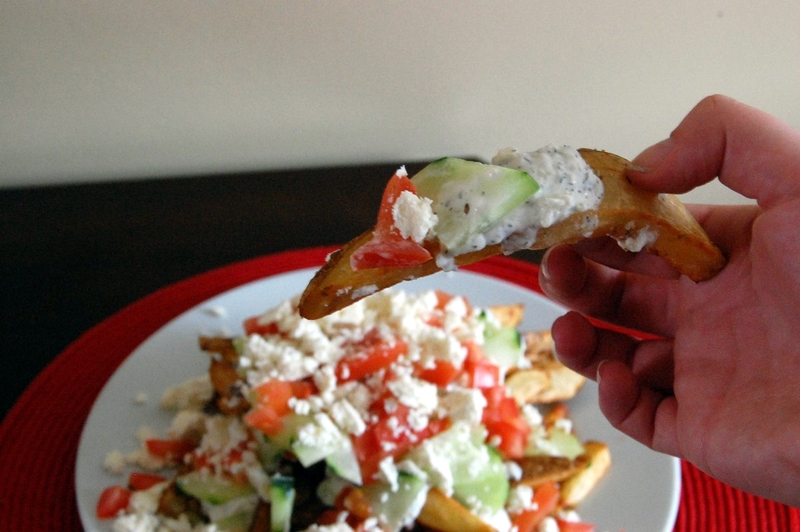 Place in serving dish and top with 3 – 4 tbsp tzatziki (or more if desired). Add tomato and cucumber and then crumble feta on top. Serve immediately. Please check out some of the awesome recipes shared at the Finding the Pretty & Delicious Linky Party this week! 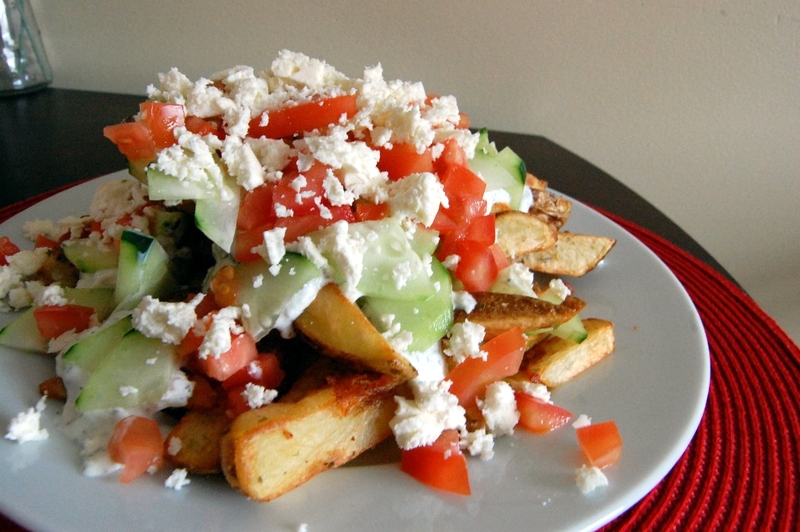 This entry was posted in Appetizers, Side Dish, Snack, Vegetarian and tagged Appetizer, Cooking, Cucumber, Easy, Feta, Fries, Greek, Potatoes, Quick, Recipes, Side Dish, Simple, Snack, Steak Fries, Tomato, Vegetarian by Lazy Suzan. Bookmark the permalink. These look amazing!!!! Would love for you to share over at Finding the Pretty & Delicious Linky Party going on right now! Thanks so much for the invitation! I’ve added the recipe and once I took a peek at your awesome posts, I followed your blog, as well. Looking forward to reading all your great recipes. Thanks for stopping by. I do this all the time!! I put salad on lot of stuff – I am a firm believer in salad and dinner on one plate…the hubs, not so much. I am a sucker for a crisp salad! I’m totally with you on that one. Oh man. These fries look SO AMAZING!!! I have to make these!!!! 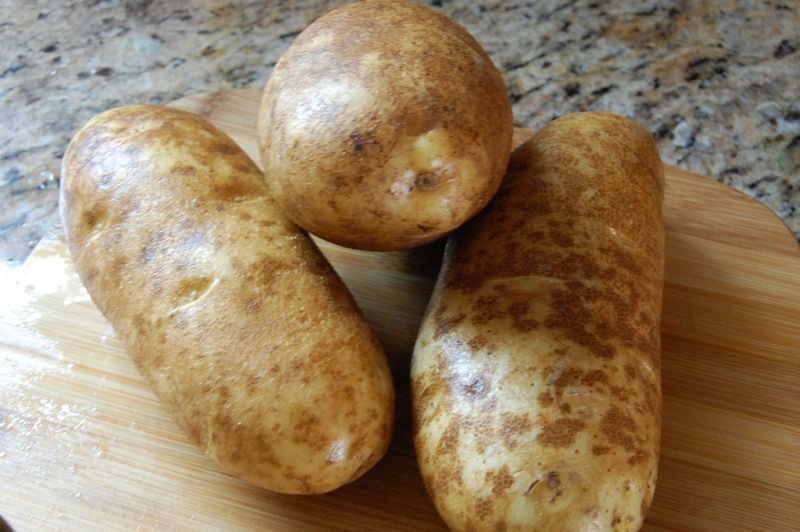 I’ve been posted this recipes too, but i use some roasted spiced cassava instead of potato…..